TRUCK EQUIPMENT and TOOLS, INC.
COOK TRUCK EQUIPMENT & TOOLS, INC. I. M. Cook Sr. and his cousin Tull R. Drum, both long-time employees of Southern Public Utilities, (forerunner of Duke Power, now Duke Energy), resigned their positions in 1918. They formed the Cook-Drum Motor Co., and became the Dealer for Anderson Automobiles, a luxury-type car manufactured in Rock Hill, South Carolina. They offered full service on any make vehicle. In 1920, Drum decided to return to the Power Company, and sold his interests to Cook. Cook purchased the assets of a Commercial Wagon manufacturer located on West 4th Street in Charlotte. 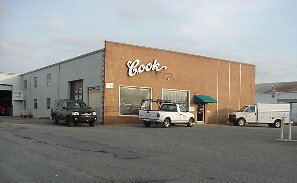 Cook, with a new partner, John B. Oates, purchased an all-wood constructed building at 2433 Wilkinson Boulevard, Charlotte. This building was originally constructed as a Laundry for the nearby World War I US Army Camp Greene; however, the War ended before the building could be placed in operation. It was a large building, about 100,000 square feet. Its design was unique; as you can see in the photo, it had nine (9) saw-tooth roof sections, each with a full row of center-hinged windows which could be tipped open at 45 degrees for ventilation. The side facing Wilkinson Boulevard had a sloped flat roof; this section housed the offices, rest-rooms, and the rear portion a paint shop. The entire floor was wood, with a concrete wash pit at the center of the building. Heat was provided by shop-built hot water radiators; these were 21 foot lengths of pipe connected at the ends and fed by a huge wood-fired boiler. Cook and Oates formed the Southern Auto & Wagon Company to manufacture Commercial Wagons, Truck Bodies, School Bus Bodies, and Truck Cabs (in the 1920s, all truck manufacturers provided only the truck chassis with a flat-face cowl – no factory-built cabs). They also did complete automobile body repairs (no mechanicals), painting, upholstering, glass replacement, etc. They maintained a fleet of three (3) wreckers with full-time operators, to bring in wrecks from all of the neighboring states. They also did repairs to trucks & commercial buses – the largest wrecker pulled a Queen City Coach bus from the Catawba River after a wreck. The claim was that the company was the largest vehicle repair facility between Philadelphia and New Orleans; during the late 20s there were approximately 100 employees. Oates left the company in 1931 and Cook renamed it Cook Body Company. During the great depression the business dropped drastically – there were days when the few employees were excited when a car came in with a damaged fender. To supplement income, and since most of the large building was not needed, it was decided to offer storage facilities for vehicles. A number of local companies had surplus vehicles, including some that had been used for mobile displays. A good portion of the building was used for the storage of these vehicles. In addition, the entire West end was leased to the Federal Goverment’s WPA (Works Progress Administration). Cook and the WPA each had a night watchman. In December 1938, the WPA watchman filled a small kerosene heater with gasoline and upon lighting, it exploded, setting the building on fire. He threw open two large doors on the West end to remove his car; high winds from the West immediately consumed the entire building. Cook’s watchman was able to remove several vehicles, but the intense heat destroyed these vehicles outside the East end of the building. 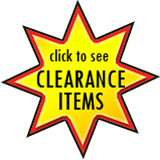 He was able to save only the watchman’s clock hanging around his neck. We were able to remove the large, heavy safe, and although the doors were warped it remains in use for record storage in the present building. After the fire, a small building to the rear of the West end was still standing, so when materials and machines were replaced, work started up again. During World War II, business began to pick up, especially in car and truck sheet metal work and painting (you could not buy a new car, and truck purchases were restricted). There was a limited amount of work for the US Department of Defense – building new truck bodies and semi-trailers (which were becoming popular). On January 1, 1947, the company was incorporated. At about the same time, it was decided to eliminate automobile repairs and concentrate on the growing truck body market following the end of World War II. At the time, the company manufactured 100% of its bodies – wood frames, and in the case of a Van Body, covered with 20 gauge cold-rolled steel sheets with galvanized metal inter-locked roofs. As aluminum became more available, some were sided using .040 aluminum, with .032 aluminum roof skins. On December 28, 1951, I. M. Cook Sr. passed-away suddenly. The Board of Directors elected his son, I. M. Cook Jr, as President. After the end of the War, Brown Aluminum Trailer Company, of Spokane Washington, started manufacturing Aluminum Semi-Trailers. They later developed an All-Aluminum Truck Van Body in kit-form; that is, they furnished two sides, a roof section, a front section, an all-steel rear frame section, and formed steel cross members (loose). We became the first supplier of an aluminum van body in the area in 1952. We provided the frame longitudinals, welded the cross members in place and bolted the sections together. We added a floor, interior lining, and rear door option to customer specifications. In 1992 the company name was changed to Cook Truck Equipment & Tools, Inc to better describe our diverse line of products, including the addition of selling and servicing power Tools for the Public Utility industry. In 1992, W. Thomas Cook was elected President of the Corporation. Other officers: I. M. Cook Jr. became Chairman of the Board; Joy M. Cook, VP, Secretary and COO; Katherine W. Cook, Treasurer. In 2016, W Thomas Cook was elected President, VP, and Treasurer. J M Cook continues to serve as Secretary, while Kitty and Murell enjoy retirment. On July 11, 2016, the company began operations from a new address: 2517 Starita Rd, Charlotte NC 28269. Cook Truck Equipment has become a leader in the industry by representing the premier manufacturers of quality Truck Equipment. We also have the expertise to offer custom fabrication and custom modifications to meet our customer's specific requirements.